Are you looking for a blonde hair look and want to try some natural process at home? There are various ways of doing so and use baking soda is a good option. 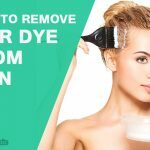 Here we explain in detail how to use baking soda to lighten hair naturally. Does Baking Soda to Lighten Hair? 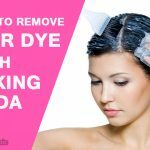 Can You use Baking Soda on Color Treated Hair? Baking soda is known for playing an excellent role as natural lightener if we can use the same at least once at a gap of every 7 to 10 days time. Use of baking soda all alone will slowly take down the color if used in short time gap. You need to mix some other natural ingredients to hold back the color on hair. 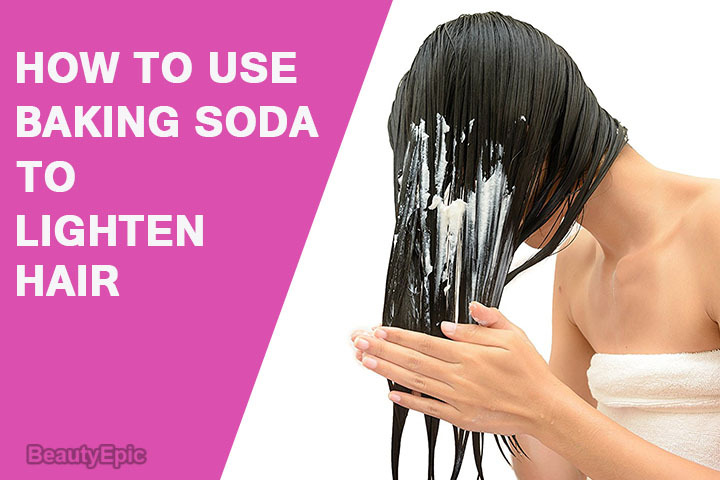 There are various ways of using baking soda for hair lightening and we are sharing few among them. Baking soda in mix with water can slowly and steadily help in hair lightening. Add lukewarm water to it and mix well to prepare to medium thickness paste. It should be too thin or thick as in both cases it will not give desired result. How it work: The baking soda paste will work on the hair to lower down the natural black color to blonde shade. Repetitions: Once at a gap of 7 days. Best time to Apply: Before your take bath. Tips: Moisturize your hair for better look. Lemon is a good hair lightener because of its acidic feature. We recommend using with water to reduce the acid level to avoid damage of hair. How it work: The acidic feature of this mix will help in lightening the shade of the hair. 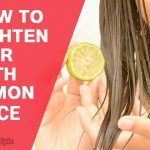 Tips: As lemon will dry your hair besides bleaching it, it is must for you to apply conditioner after hair wash.
Anti dandruff shampoo works best with baking soda for lightening hair. Take baking soda and shampoo in 1:1 ratio depending on the length of the hair. Make an even lather and apply it on your hair. How it works: Besides cleaning the hair it will also lower down the hair color few shades below the natural one. Tips: Use hair conditioner to make your hair soft and healthy. 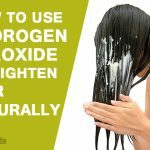 Hydrogen peroxide is a natural element which lightens hairs faster than any other ingredients used for lightening. How it works: It acts on your hair faster and will give the desired lightening result which you are looking for. Repetitions: Once every 7 days till you get the shade. Tips: Your hair may get dry to apply conditioner after hair wash.
By vinegar we mean to say Apple cider Vinegar which is completely safe for hair lightening. Apple cider acidic feature bleaches the hair perfectly and give a reddish look to it. How it works: It will give an evenly reddish look to the hair naturally. You will find it as one of the most effective methods of hair lightening. 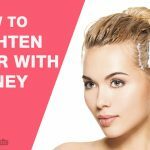 Tips: You may find your hair harsh after this treatment. Apply coconut oil or conditioner to soften it. Honey is also a natural acidic ingredient which can lighten the hair without causing any harm. How it work: This will give a fine lightening tone to hair and will make the hair thick and healthy. Best time to Apply: Always before bath. Tips: Keep your hair conditioned after wash. The harsh element of the dish soap will help in lightening the hair color fast. Take 3 spoons of baking soda and mix with 4 spoon of shampoo. Combine all well to prepare a smooth mixture. Now apply the mix on dry hair before it gets saturated. Cover hair using shower cap and leave for 20 minutes. Wash the hair using Luke warm water. How it works: It acts effectively for fading semi-permanent color of hair. Use of dish washing soap’s will work considerably to strip the hair color just with first wash.
Repetitions: In 2 to 3 day’s gap. Tips: Condition well to make hair soft. At time of using lemon and apple cider vinegar or any of the one with baking soda for hair lightening, you must check that there is no open wounds on your scalp, as applying the mix may cause serious skin irritation. Baking soda when used with other natural ingredients for hair lightening gives better results. In case you have any skin allergy then consult your dermatologist before you apply baking soda on your hair for lightening.